Shayna Swanson has been creating and performing aerial works that have been described by the Chicago Reader as “truly heart-felt and creative” for over 12 years. Renowned for her cyr wheel and aerial rope acts, she’s received awards at several circus festivals, including the the 2012 Women’s National Title in Cyr Wheel, Glenn P Davis Scholarship for the Aerial Dance Festival, “Best Overall Performance” at the American Aerial Acrobatics Festival, “Circo Nortemericano Award” at the Circuba Festival in Havana as Shayna Swanson is an, award-winning circus artist, founder and Artistic Director of Aloft Circus Arts, and founder of the Chicago Contemporary Circus Festival. Her artistic work pushes the limits of physicality and emotion. She has been creating and performing aerial works that have been described by the Chicago Reader as “truly heart-felt and creative” for over 12 years. As a former competitive gymnast and diver, her work naturally fuses difficulty, strength and intricacy with thoughtfulness and surprise. Shayna developed her circus voice through independent study of the body in vertical space, but refined her skills through training at Circus Maniacs in Bristol, England, and with private tutors like Elsie and Serenity Smith, Fred Deb and Norboul Meirmanov. In 2005 she received the Glenn P Davis Scholarship to the Aerial Dance Festival, awarded every year for excellence in aerial choreography. That same year Shayna formed Aloft and, with a grant from the City of Chicago, produced the critically acclaimed full-length show “Rolling Blackouts”. In 2006 her choreography was selected into the repertory of Thodos Dance Chicago and featured in the Best of Dance Chicago Showcase. Also that year the Chicago Reader named her a “Mover and Shaker” of the Chicago dance scene. She has been acclaimed at national and international aerial and circus festivals. Her unique rope act won the “Best Performance of Festival” Award at the 2011 American Aerial Acrobatic Festival, a Special Prize at the 2011 Circuba Festival in Havana, Cuba and was featured at the Huishan Acrobatic Festival in Taiwan and Collision Arts Asia Festival in Malaysia. 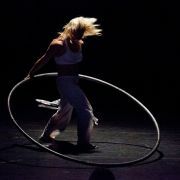 She is also the 2012 US National women’s Cyr Wheel Champion. Shayna formed the Aloft Loft in April 2006 to provide a supportive and vibrant community training space for physical artists of all sorts. The Aloft Loft is now one of the top professional training spaces in the USA. Since founding Aloft Circus Arts, Shayna has created 5 full length shows and 4 interactive performance parties. She was the co-aerial director for the first and second incarnations of the massive church/circus hit “Imagine Christmas”. “El Circo Cheapo Cabaret”, part talent show, part vaudeville, part punk rock warehouse show, has toured across America, selling out shows weeks in advance every month in Chicago for the last 5 years. In addition to producing and creating her own shows, Shayna’s work has been seen in Circus Flora, Pegasus Variete in Germany, the Kim Tom Clown Festival in Shanghai, Mint Fest in England, Olympic festivities in Hong Kong, Vivendi Cabaret in the Cayman Islands, resorts in the Caribbean and with productions like the Lyric Opera of Chicago, Cirque de a Mer, The Coor’s Light/Maxim Model Search Tour, New Vision Cirque, The Big Aerial Show, The Midnight Circus and Circus Smirkus. The past year has been Shayna’s most productive. Seeing the need for a world class circus festival in the USA, Shayna founded the Chicago Contemporary Circus Festival, which brought 10 national and international shows to Chicago. She also began a Full-Time Intensive Training Program for aspiring circus artists at the Aloft Loft, remounted her 2006 show “Dinner of our Discontent”, began development on a new creation, wrote and directed the multi-media spectacle “Sephira”, began a Residency Grant to artists wanting to create new shows, AND gave birth to a beautiful baby boy.well as participation in the Kimtom Clown Festival in Shanghai, Collision Arts Festival in Kuala Lumpur and Huashan Acrobatics Festival in Tiawan. She was seen in Europe at the Pegasus Variete, and MintFest in the UK. Her teaching experience extends to master classes around the US and the world. Stateside she keeps busy performing and teaching with her circus company, Aloft Circus Arts, and running The Aloft Loft, the 3rd largest circus school in the US. She’s also a current company member of Circus Flora and has worked with The Midnight Circus, Circus Smirkus, Cirque Voila, Cirque de la Mer, Zyngara, New Vision Cirque, Circesteem, The Lyric Opera, The Big Aerial Show, Cirque du Soleil, and many corporate clients. Gala clients have included Seneca Niagara Casino, Harrah’s, Absolut Vodka, Maxim Magazine, Crobar, Crunch Fitness, Ford Motors, Air France, The City of Chicago and many more.